Today, September 27th, the Catalan Parliament voted in favor of a resolution to hold a referendum on Catalonia’s independence. The approved text pledges to organize a democratic plebiscite in a maximum of four years. The voting showed a clear majority in favor of the resolution. Most Catalan parties voted in favor of a democratic referendum, while some of them abstained. 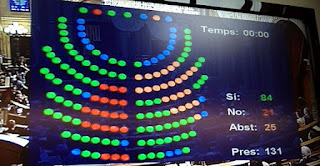 In the end, a majority of 84 representatives voted in favor, 25 abstained, and just the Spanish nationalist minority voted against the resolution. The 21 representatives that have voted against showed clearly their colors by refusing to listen to the wishes of the Catalans. However, Catalans have already voiced their wishes clearly: 84 in favor, 21 against. And so Catalonia begins its democratic march for freedom!